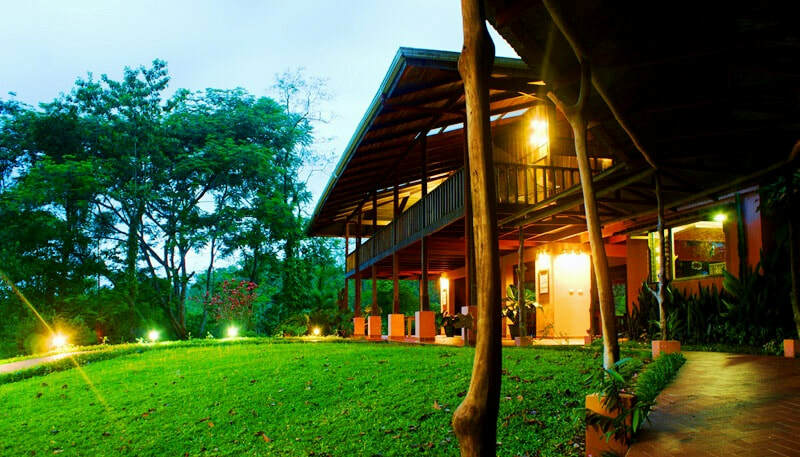 Finca Luna Nueva Lodge is a sustainable rainforest eco-lodge hotel, offering an intimate experience of primary rainforest together with a certified organic biodynamic farm. They began farming here in 1994, planting and harvesting organic ginger and turmeric, and promoting sustainable agriculture and conservation in the local community. In 2003 they decided to take their promotion of sustainable practices to the next level by building several beautiful eco-lodges using fallen timber from the farm. The lodge offers four lodging options: Casa Luna, Casa Sombra, the Family Bungalows, and the Individual Bungalows. All rooms offer rustic yet luxurious accommodations on the edge of the Costa Rican rain forest, constructed with fallen timber from the farm. All accommodations are on the same property and are within a short walk of one another. The food is complemented with a bountiful assortment of organic greens, fruits, and herbs from the certified organic biodynamic farm and of course the selection of meat is from our pasture raised animals. The restaurant offers many different selections, as the menu varies depending on the weekly harvest. They strive to provide the guests with delicious fare, bringing in local products from farmers in Costa Rica. The lodge has a 50 foot high observation tower, a solar heated Jacuzzi, an ozonated swimming pool, and a handicapped accessible rainforest trail. Now you can experience the Costa Rican rainforest, learn about the farm sustainable practices and relax in the rustic yet luxurious accommodations. Transfers from San Jose area hotels or San Jose's Juan Santamaría International Airport to hotels in the Arenal area are $170.00 each way, for a minivan with a capacity of up to 9 passengers. Approximate time from San José to the Arenal area is approx 2 hours and 45 minutes. Transfer from Juan Santamaría International Airport to any hotel in San José $35, including airport assistance, for a minivan with a capacity of up to 9 passengers.